Drywall sanding is a widespread business that may require you to go from one particular place to the next. To protect your prized sanders, Edisons now brings you the Unimac Drywall Sander Bags. Designed to fend off harmful elements, these bags are waterproof to deliver utmost protection for your construction tool as you make your way from one spot to another. When not in use, they can protect against dust, dirt and other elements which may decrease the overall value of your sanders. Compatible with Unimac Dustless Drywall Sanders and other models, Unimac Drywall Sander Bags are available in small and extra large versions. Made from high quality plastic fibres, they are built tough and easy to clean. Just wipe them down with a simple cleaning cloth and you’re good to go. Unimac Drywall Sander Bags have durable carry handles to help you carry all the contents in your arms conveniently. With everything organised in place, you can focus more and easily improve on the quality and quantity of your work. Use them not just to deliver professional results, but also to boost your network of consumers by projecting a more professional image for your operation. In addition to Unimac Drywall Sander Bags, Edisons also offers high quality Unimac Drywall Sander Replacement Dust Bags to ensure minimal clean up as you work. For every purchase, you will get three quality dust bags which are designed to withstand even the toughest renovation jobs. Each bag is equipped with a comfortable shoulder strap for added convenience. Edisons also offer other Paint and Plastering Tools and Accessories to help produce professional sanding/finishing results. These include Belt and Disc Sanders, Drywall Lifters and Paint Sprayers. Also available are Workshop Equipment such as Saws, Hydraulic Presses, Rebar Cutters, Ladders, Laser Levels, Measuring Tools, Diesel Industrial Heaters, and many more. Make drywall sanding as comfortable, as convenient and as clean as possible. 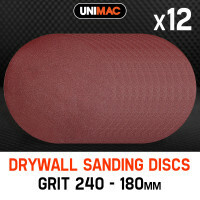 Order a Unimac Drywall Sander Bag and a Unimac Drywall Sander Replacement Dust Bag today!